More than one million people living in the Denver metro area have been warned about possible lead contamination in their tap water. The problem is traced to older lead-based piping that exists in those older homes. High levels of lead were discovered in a routine check of the water system. Lead concentration was detected in 8 out of 60 homes, with one home testing four times higher than federal standards allow. Denver Water said the problem could exist in every older neighborhood in the Denver metro area and that it is especially true for any home that was built in the 1950s. Lead poisoning can lead to many health problems, including brain damage and kidney failure. Let faucets run for several seconds to flush out lead. Only draw cold water for drinking, cooking and preparing baby formula. Concerns over problems with lead content in the water should be taken as seriously as problems associated with lead paint. We suggest that this is just one example of the type of problems that crop up in our water supplies all over all the time. 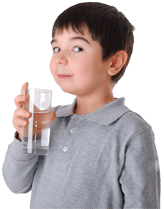 Don’t wait until you know you have a problem to protect your family’s health with a good water filter.